Playing a bizarre mish-mash of ’70s-era soft rock and Syd Barrett-inflected psychedelia, this British band was co-founded by Blaine Harrison and his guitarist/father Henry. The elder Harrison encouraged his son, at the age of twelve, to form a band as an activity to partly deal with his confinement to crutches due to spina bifida. 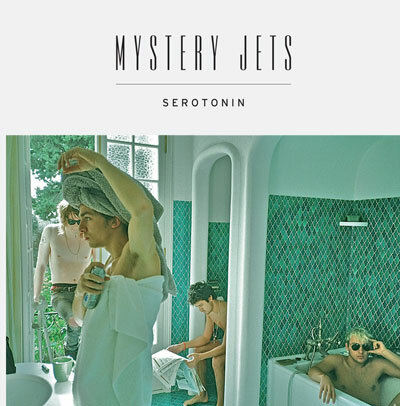 Following 21 from 2008, Serotonin is still quite informed by a love of 10cc and ELO, but the new tracks shift away from the sometimes exuberantly chaotic sound of their first albums for a more ’80s-inspired set of carefree pop songs. “Dreaming Of Another World” and the title track feature bouncy hooks driven by glam-rock guitars and New Wave synths reminiscent of Pulp (likely influenced by producer Chris Thomas, the man behind Different Class and Roxy Music’s modern classics). Meanwhile, jubilant whistles and kazoos somehow work well amid the odd romanticism of “Flash a Hungry Smile”, as Blaine sings about “birds and bees” and STDs. After three albums of scattered availability stateside, this five-piece from Eel Pie Island (a whimsically sounding place that complements the whimsical sound) are releasing what promises to be their inevitable breakout. Watch the video for “Dreaming Of Another World” after the jump. Serotonin hits stores on July 13. Buy this at Other Music or iTunes.